All other apps making money from online games, advertising, & from selling emoticons or stickers but how does WhatsApp generate revenue? Even their services are free of cost? How they are earning at all without any ads? 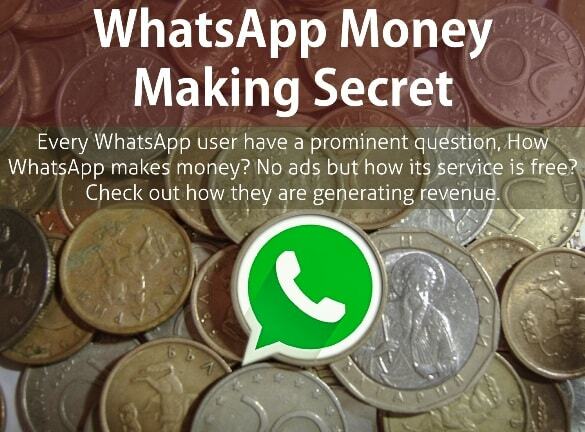 The WhatsApp have the perfect way to make money. Everybody wants to know WhatsApp earning, rather I would like and insist everyone know about the WhatsApp business model. Till 2014-18; WhatsApp has an estimated $38m+ per annum in revenue, and if you find WhatsApp income per day then you will get the answer around $4770+ bucks per day. Check out this social research on how they are generating revenue, adding millions of new users daily to grow their database and how they utilizing your personal data for making money. Last time you have seen How to access the WhatsApp on desktop and How to check who has read your messages in WhatsApp. But today we are going to see how WhatsApp app grawing day by day and WhatsApp making money. You also like to know who owns WhatsApp before, today? WhatsApp was released in 2009 by Brian Acton and Jan Koum. Initially, the main intention was to send short messages over the internet, but later as people get addicted and still they are, the app then allows the user to send media including text, images or videos to their friends added from the contact list who already had to install WhatsApp-app on their device too. Its code and application file is open-source to download for iPhone, Android, Windows phones and recently they started to access messages on desktops through the browser. Later on, a few years back, Facebook took over the WhatsApp for $19 billion in Feb-2014, there are 940+ million subscribers who are still using WhatsApp in their smartphones and those are still rising day by day. WhatsApp announced that it’s free of cost to use for first one year and after that, it will be charged for $1/year as subscription fees. There are lots of questions about WhatsApp, how they are producing profits from; since there are no ads shown in the app. Why it is free? How they make money from it? There are lots of security questions too. How they get returns on collected information? WhatsApp is not involved in ad marketing & the fact that it does not support advertisements. With my solid guess, the returns are made for WhatsApp is mainly through database-management. The social networking sites like Facebook, Twitter, Instagram collect personal information from the users and stored into their huge database. And yeah! you are right, the WhatsApp is also one of them. They also get the personal information and saves all the collected info in the database and secure it. Further it’s been used to sold out to big enterprises like E-mail marketing database companies. These companies are then able to show and pass the advertisements according to the user’s interest and activities. What they do is not directly sell the data to the advertisers, but rather let the advertisers target you based upon the information provided by you. Let's say, you've mentioned your location as 'Mumbai' and interests as 'movies' and if PVR wants to advertise their upcoming cinema hall to all the movie lovers in Mumbai then they are able to do so. In short; A lot of modern social apps (and non-social apps too) do not generate any ad-based revenue. They do however collect a lot of data that is valuable to them or other companies. Think about Microsoft buying Skype or Facebook buying Instagram. Having these services allow the purchasing company to have data that they can then use to build other targeted products. According to one report, WhatsApp exceeds 800 million monthly active users. With such extensive data available on WhatsApp database, the big companies are willing to pay attractive amounts for data-extraction. How they got and are using my personal information? It's going to be a misuse of my information? If you are thinking like this, then stop - Because you already accepted this kind of rules and regulations of WhatsApp on installing the app by clicking on 'Accept' button. In some countries, fees are only $1 at a time. In some other countries, the app costs about $1 per year to download and as a promotion, the first year is free. After the one year, WhatsApp takes $1 as a subscription fees. So think, there are 920+ million users and each one paid $1, this is a huge profit for WhatsApp. In India, this subscription fees are not appropriate but it started in other countries. Everyone get install constantly where lots of peoples paid subscription fees yearly. WhatsApp charges yearly subscription fees in most of the western countries, that causing one of the main source of income for them. Now WhatsApp is owned by Facebook and it does not show advertisements. Facebook bought them only to be in control of the world's favorite mobile messenger. By growing market saturation, the app becomes essential and the user database is still rising. As the number of users are growing, not only this does the subscription service of $1/year bring in considerable income but advertising and alternative forms of monetization generate huge profits.